These were the first words of Kawhi Leonard on a very weird media day in Toronto, where he was introduced as a Raptor for the first time together with former San Antonio Spurs teammate Danny Green. I thought it was weird because although a familiar face in Green was in the room, he was seated beside Masai Ujiri and not Gregg Popovich. There were no signs of Tony Parker, Manu Ginobili, and Tim Duncan. It was weird because Kawhi was in Toronto, representing a new team, talking about a new future, being excited about a new journey. That’s weird. Kawhi isn’t supposed to be anywhere else but Texas (or Southern California), he isn’t supposed to talk about himself, and he definitely isn’t supposed to be excited. Yet here he was, the NBA’s super mysterious, super stoic, soft-spoken android with 2001 cornrows saying the one thing he is categorically not known for: being a fun guy. Joel Embiid, when he’s on his phone, is a fun guy. Steph Curry, when he shimmies after a made three, is a fun guy. JR Smith, when he’s not throwing away crucial Finals games, can be a fun guy. Lance Stephenson, Michael Beasley, JaVale McGee—they all seem like guys who know how to have fun. Dwight Howard, who still hasn’t learned his lesson in picking fights with Shaq, desperately wants to convince the world that he’s a fun guy (the world is still not convinced). But Kawhi Leonard? He’s just not a fun guy. At least not on the court during the six years (let’s just scratch out the horrific Year 7 from our memories, shall we?) he thrived as a Spur. He was a serious guy, an all-business guy, a no-reaction guy, a hardly smiling type of guy. His gaze always conveyed emptiness and longing, as if he’s someone living in a perpetual state of Did I Leave the Stove On? So when Kawhi was asked: A lot of people up here don’t know much about you. How would you describe yourself and what do you want people to know about you?, it took him a whole five seconds before coming up with a response. “I’m a fun guy,” he said, in the most not fun tone possible, his eyes revealing nothin, his eyebrows not moving one bit. “Obviously I love the game of basketball. I mean, there’s just more questions you have to ask me in order for me to tell you about myself, I just can’t give you a whole spiel.” This would be a great Twitter bio, I thought. Then it got weirder, really, really quick. “I don’t even know where you’re sitting at,” Kawhi joked. Kawhi. Joked. Then he laughed, in a way no one has laughed before in the history of laughing. It sounded like it was suppressed for a year, it almost felt like a cry for help. It was…unique. And it was exactly what you’d expect from Kawhi Leonard. 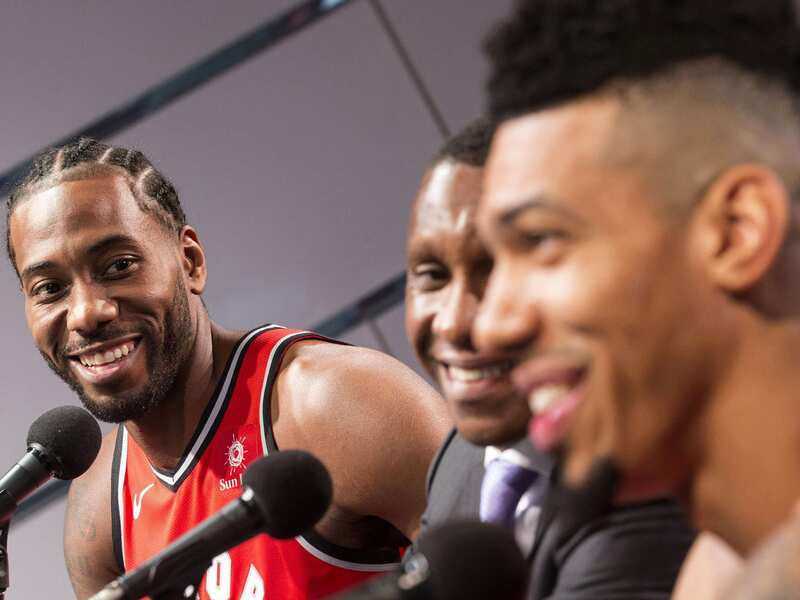 On media day, the question of what went wrong in San Antonio was inevitably hurled at Kawhi, prompting Green to quip, “You knew that was coming.” But Kawhi, as always, was slippery, only giving the obligatory “I have no regrets.” He even laughed a second time at that point. The last time I witnessed a Raptors press conference, it featured the long faces of Kyle Lowry and DeMar DeRozan mourning the death of another lost season at the hands of LeBron James and the Cleveland Cavaliers. 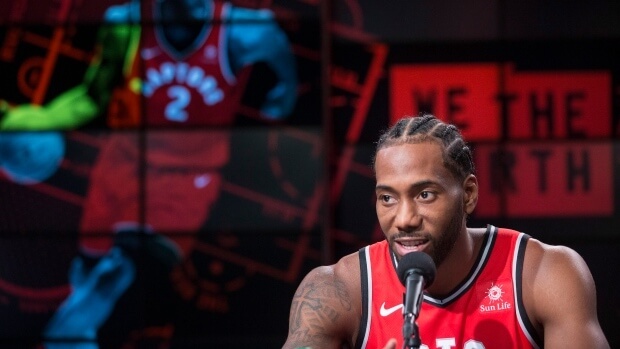 This time, it had Kawhi talking a bunch without really saying anything, Ujiri talking big about the Toronto vibe every chance he gets, and Green providing the punchlines. But it was really about Kawhi. The only long faces during the 20-minute press con, I’d imagine, belonged to the fans of the Spurs (and fans of Laughing Normally) as they listen to Kawhi talk about his new journey. 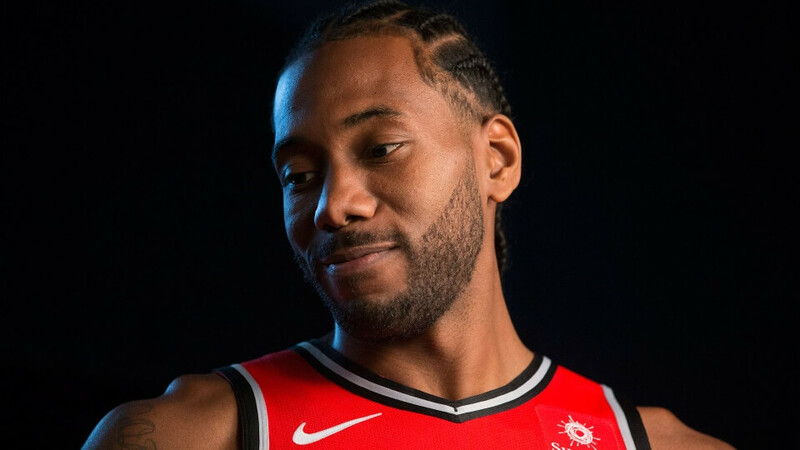 The huge takeaway from it all was that Kawhi’s laugh sounded weird, but the really weird part of it all wasn’t the laugh, but the fact that Kawhi was wearing a red jersey, which meant that he wasn’t wearing a black jersey, which meant that he was no longer playing for the Spurs. The Kawhi introduction in Toronto is just the start of a series of weird (and fun) truths we’ll have to accept this season. A weird, alternate NBA universe? That might as well be the theme of the 2018-2019 NBA Season. The bullet points have been wild so far: LeBron James going to Hollywood, the Golden State Warriors adding yet another All-Star, Carmelo Anthony forming yet another Big 3, Tony Parker wearing Charlotte blue, and Kawhi Leonard no longer a Spur. Weird is fun, weird is good.